Back in stock. 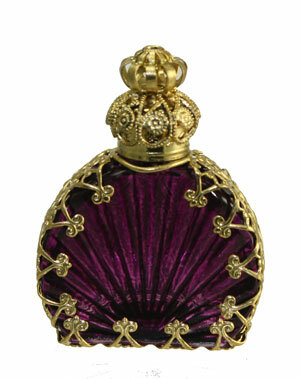 Purple bottle with gold accents and faux amethyst stones. 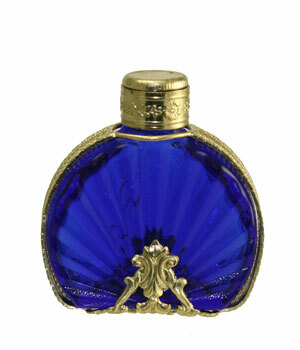 Royal blue bottle surrounded by gold filigree accents. Filigree screw on top. Simple and elegant. This necklace is a deep purple color, encased with silver tone filigree and adorned with faux pearls. Filigree screw on top, accented with faux pearl. Picture shows a light purple bottle, however, the bottle is actually a little darker amethyst/purple color. The peal design on the front of the bottles is also slightly different. We will try to get a new picture soon! 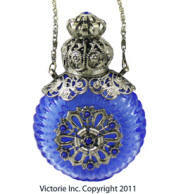 Necklace is a light sapphire blue color, encased with silver tone filigree and adorned with faux sapphire pearls. 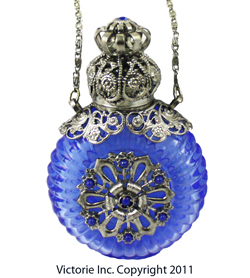 Filigree screw on top, accented with faux sapphire crystal. Color is now a darker cobalt blue. 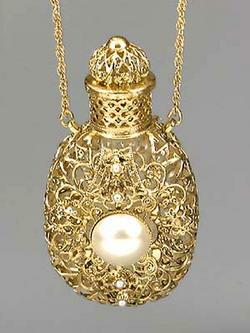 Gold toned filigree necklace is adorned with faux pearls. 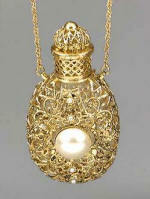 Filigree screw on top, accented with faux pearl. 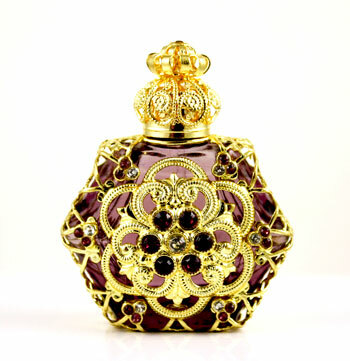 Deep purple fan bottle with gold filigree accents. Filigree screw on top, accented with faux amethyst stone. Do you like silver? 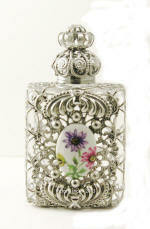 This is a clear bottle adorned with a silver plated filigree and floral cameo. Filigree screw on top, accented with faux diamond stone. 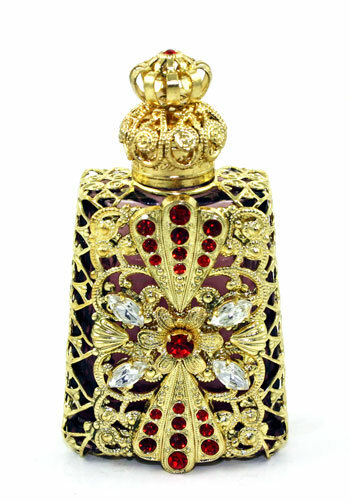 Another purple and gold filigree bottle. 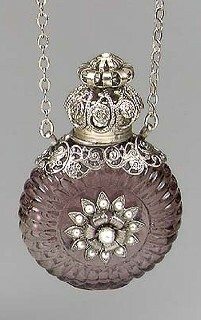 Adorned with faux amethysts. 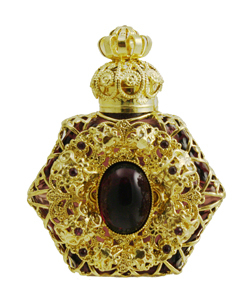 Filigree screw on top, accented with faux amethyst. 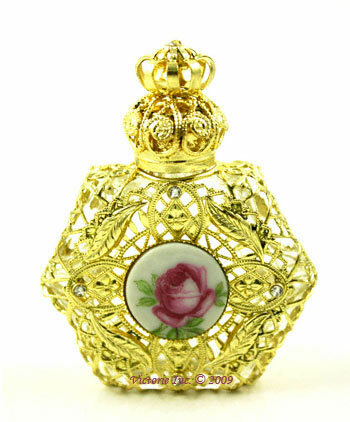 Dimensions: 2.5" Tall Capacity 9 ML. 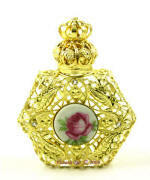 This bottle is made with clear glass and is adorned with a gold tone filigree and beautiful rose cameo. 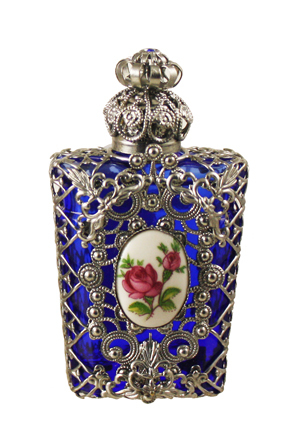 Filigree screw on top, accented with faux diamond..
Blue glass bottle is adorned with antique silver tone filigree. 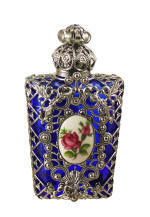 Filigree screw on top accented with faux sapphire.